This technique was created for physical health services, but we love it! 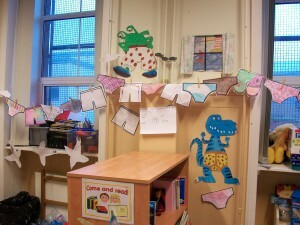 By providing a washing line (with string and pegs, velcro, blue tack or a noticeboard) and blank pants and tops, you can create a way for younger children to tell you what is tops (good) and pants (bad) about your practice. From the Taking on the Challenge – Shaping Health Services through Young People’s Participation document and an idea from Manchester Children’s hospital.